Our neon-colored emery boards are made here in the USA and come in an assortment of 4 background colors. Neon colors are green, yellow, orange and pink. Black ink is only imprint color available. Orders are printed with approximately the same quantity of each color. 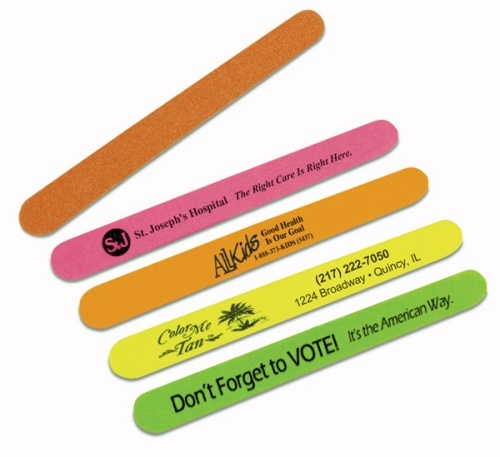 Neon emery boards are 4-7/8 x 1/2" in size with an imprint area of 4 x 3/8. Prices include straight line typesetting, 2 lines recommended, 3 lines max. One background color is available in neon boards for an additional $30.00 charge.